The Gorilla Nantucket Playset is visually appealing and will look great in your yard. It is perfect for a medium to large-sized yard and can accommodate up to 7 kids. 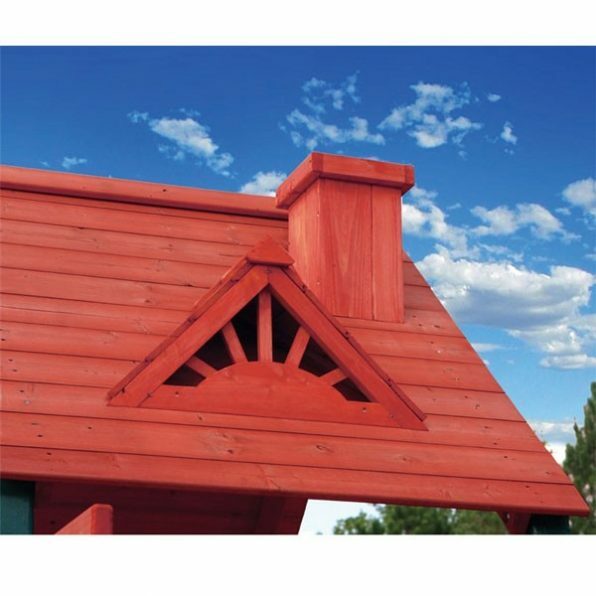 The play club house has a unique roof with two working windows, a sunburst design and even a chimney. Between the club house, trapeze bar, rock wall, and sandbox the kids will be busy for hours. 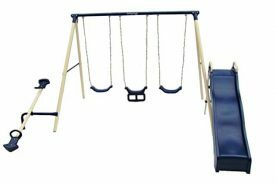 1 What are the features of the Gorilla Nantucket Swing Set? 3 What is the size of swing set and what tools are needed for assembly? 4 What is included in the Manual? 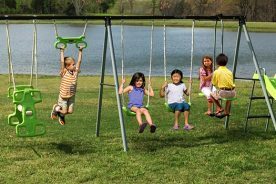 5 How do I maintain a safe and lasting swing set? 6 What kind of warranty does the Nantucket swing set include? What are the features of the Gorilla Nantucket Swing Set? Climb aboard this innovative Nantucket cedar swing set and experience an entirely different world through imagination. Pick one of two entry points in order to reach the 4 foot square play deck that is 4 feet off the ground. The one that’s probably going to be the main pick is the rock wall. 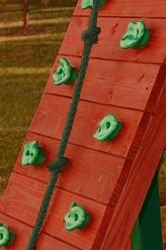 Children will learn to pay close attention to where they place their feet and get a really good grip with their hands on the “rocks” to climb up. For the little more adventurous maybe they’ll instead choose to hold on tight to the rope and pull themselves up the wall. 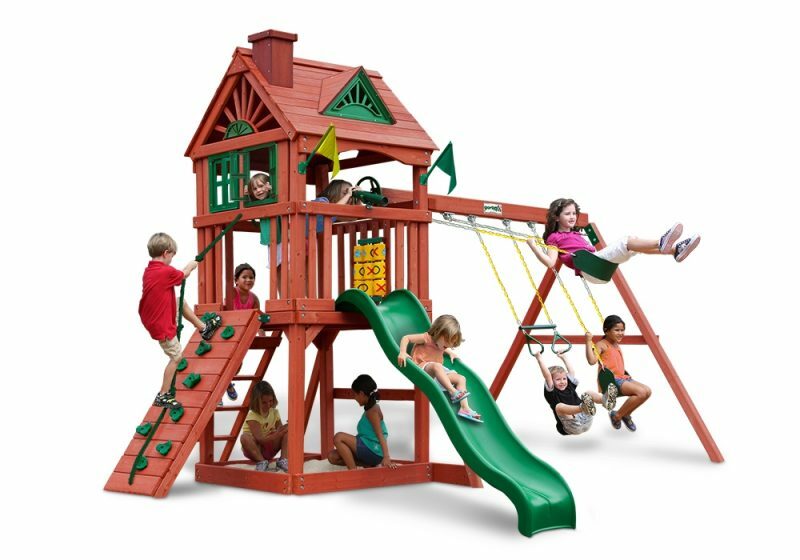 Racing to the top will be the first objective when kids see this Nantucket Cedar Swing Set and the fastest way up is the safe entry way ladder. Once they have reached the top they’ll really start to get into their imagination. Children will be able to play captain when it comes to all this play deck has to offer. With a steering wheel kids can guide their ship in whatever direction they so choose. Make sure there are no icebergs anywhere in sight. With the play telescope kids will be able to see it all. What is a ship without flags? The Gorilla Nantucket swing set includes a flag kit with two flags which go on the pillars of the play deck. This entire play deck is covered by a wood roof with house-like features such as the chimney and windows that open and close. These are great for the little kid that may want to “play house”. Kids will enjoy playing in the cool sand of the sandbox underneath the play deck. Attached to the play deck is the 3-position swing beam. 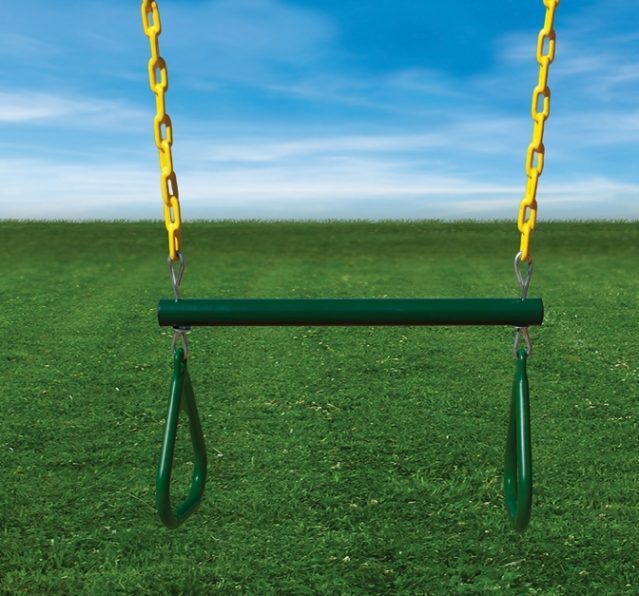 Kids can blast off and see how high they can get on the two belt swings. The third swing is for the little monkey of the family and they’ll be flipping around on the trapeze bar with rings. The chains on each swing are coated with plastic which will stop little hands from getting pinched by the chains and help maintain easy upkeep and lasting material. 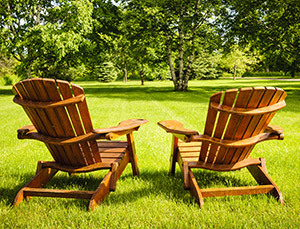 The Nantucket cedar swing set, under warranty, should only be set up in your backyard. We don’t recommend having your little ones under the age of three play on the swing set without adult supervision. The swing set is recommended for no more than 7 kids at one time under the age of 12. The playset should not be set up on a hard surface such as concrete or packed earth. After the play set is assembled you’ll want to apply a shock-absorbing surfacing material such as mulch or shredded tires. Loose surfacing helps keep kids safe by reducing the chances of injuries caused by falls. 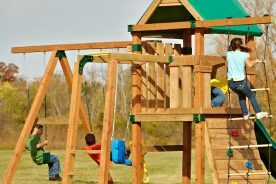 What is the size of swing set and what tools are needed for assembly? 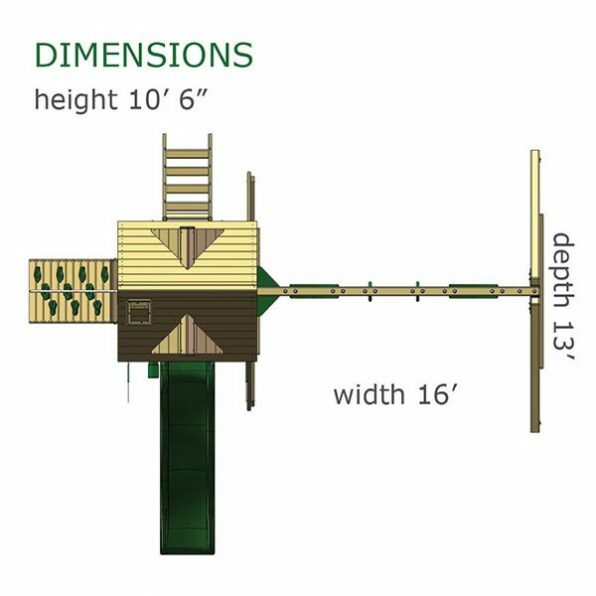 The dimensions of the swing set are 16 feet in width, 13 feet in diameter and 10 feet, 6 inches in height measuring at the top of the wooden roof. This swing set makes an excellent addition to a large backyard. Make sure that you have enough space in your backyard before purchasing the Nantucket playset. This is really important! Do not forget to factor in the six foot “safety zone” distance between the swing set and any structures when making sure your backyard is big enough. Additionally, factor in 6 feet of air space above to clear any tree branches or power lines. Estimating and “eyeballing” the space can leave you in a tight spot, so pull out the measuring tape. The Nantucket swing set comes packaged in four boxes with a combined weight of 580 pounds. Make sure that you have someone on hand to help carry the boxes from your driveway to your backyard. What is included in the Manual? Every swing set by Gorilla Playsets comes with an instruction manual. The manual lays out the easiest way to assemble the Nantucket swing set step by step. The detailed drawings are a hug help when it comes to assembling the set. Follow and read the entire manual before construction to make sure you get the most out of your swing set. Make sure that you check each part thoroughly when you first receive the swing set. Each part is clearly labelled in the instruction manual, so that you can easily identify them and verify that they were correctly included in the set. Gorilla Playsets has excellent customer service and will work with you to replace any broken or missing parts quickly. How do I maintain a safe and lasting swing set? The most important step to ensuring that a wooden swing set lasts a long time is to seal the lumber. Do this within the first ninety days after assembly. All lumber included with the set is factory stained giving it resistance to rot, decay and insect damage, but it is not sealed. You may find a variety of sealants at most hardware stores. Check and tighten any loose bolts, nuts, or screws every Spring and at least one other time during the Summer or Fall months. Use Pam, Mazola, or olive oil on any squeaky belt swings or trapeze. Do not use any petroleum based products such as WD-40 or motor oil. These may corrode the belt swings and plastic around the chains. Avoid using pesticides on your swing set for the same reason. Dab dish soap in the corners under and in the play deck to keep wasps and yellow jackets from building nests there. Lastly, don’t let your kids get stuck on a slow slide. Wipe the slide down with wax paper every few weeks to keep smooth and slick. What kind of warranty does the Nantucket swing set include? The swing set manual has all the warranty information such as how to register and an in-depth description of what’s covered in all situations. There is a 10 year coverage for the structural wood components. This applies to any defects due to workmanship or material. For all other parts there is a 1-year warranty. This Gorilla Nantucket swing set offers so many years of fun. 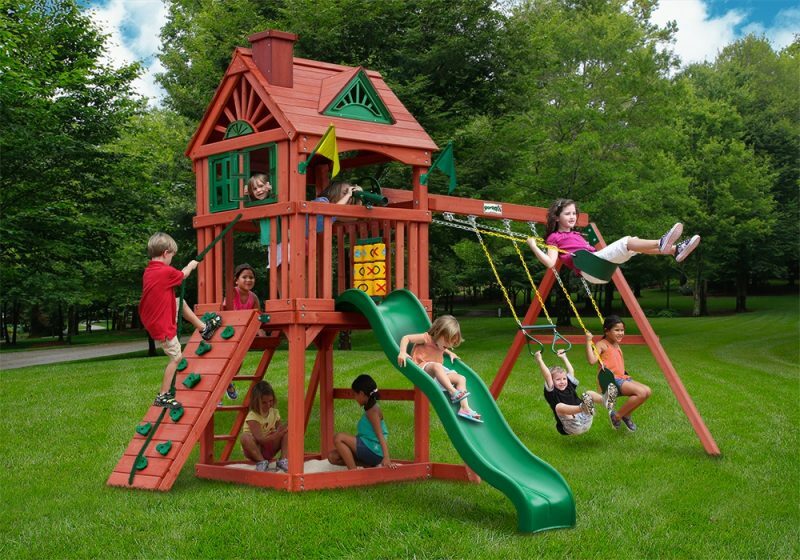 Your children will spend endless hours playing in the backyard on this amazing swing set. The durability and craftsmanship put into all Gorilla swing sets will not leave you disappointed. Don’t pass up adding some adventure to your backyard.